Family Dentistry Assoc. of Monona - Monona Chamber & Economic Development, Inc.
Our friendly competent staff is dedicated to patient comfort & quality care. For decades, our dentists and staff have been delivering very gentle, family-oriented dental care to the adults and children of this community. We have many loyal patients who've been with us for generations. Thanks to our patients, we've grown our business & have built a brand new medical office facility in Monona. It's conveniently located due west of MFL MarMac's athletic fields, next door to the Family Aquatic Center, & right off of Highway 18/52 at 602 Tower St. We moved in April 1, 2017 & welcome you to visit us soon at our new location! 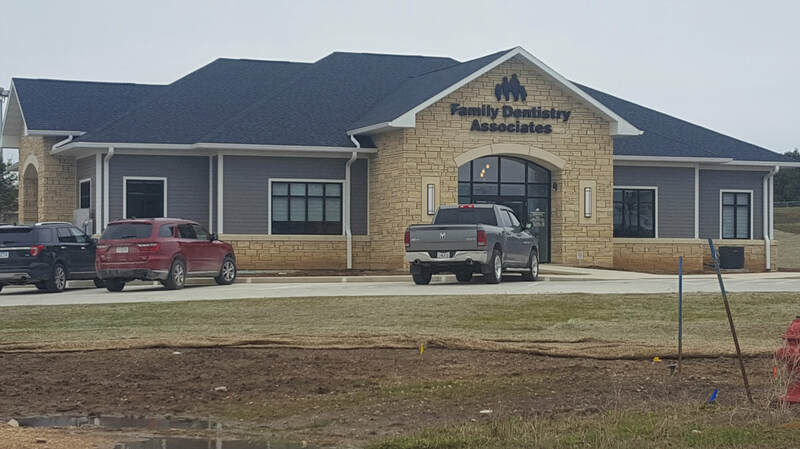 In 2015, Family Dentistry celebrated 30 years in business providing dental care to Monona and the surrounding community. And to thank the community for its support over the past three decades, the doctors and team provided 30 RAK ("random acts of kindness") to various individuals, groups, and businesses. Surpassing OSHA requirements, we employ only the very best in equipment sterilization techniques available to dentists through our modern sterilization system. We are so proud that our office fully utilizes the latest in dental technology and equipment and state-of-the-art treatment options. The source of water for our dental units is distilled water (bottled water), which removes any chance of contamination from regular tap water like that used in most dental offices. Tooth Fairy Drawing (every month) – We make it fun at Family Dentistry Associates of Monona with a monthly drawing for our patients 12 years and younger who have cavity free check-ups. Stay cavity free by using our brushing chart to become eligible for this monthly drawing. Celebrating Children’s Dental Health (each February) by the doctors and staff visiting area schools and educating our young patients the importance of taking care of their teeth. “Choppers” and “Flossy” like to tag along to the visits as well and bring many smiles to our elementary kids. Summer Bike Giveaway – Kids age 12 and under may register to win a bike and safety helmet after their dental check up during the month of June (winner announced in July). Back to School Book Bag Promotion (each July) – The doctors and staff enjoy helping our local students get ready to hit the books with our back to school promotion by having a drawing for multiple book bags to be given away. Each book bag is filled with school supplies and children are eligible for the drawing after their dental check up. ​In addition to general dentistry and cosmetic dentistry, we are certified in Invisalign -- the clear alternative to braces. Please set up your first consultation appointment that will be AT NO CHARGE FOR YOU! ​We also refer our patients when needed to Periodontics (gum diseases), Implant Dentistry, and Endodontics (root canal treatments), as well as other specialists. Our team emphasizes comprehensive quality care and preventive dentistry. ​Each day, our doctors appreciate & encourage our staff; and, in turn, our staff appreciates & cares about our patients' well-being. (563) 539-4651 or email us. family to our dental family!